So far, Brooklyn Nine-Nine’s third season is perfectly fine. With the exception of “Halloween, Part III”—which built from the first two episodes of that trilogy—the first seven episodes of this season haven’t exactly been the series’ most memorable. A lot of this is simply because of how much of these episodes have been set-up for the new normal, whether it be Jake and Amy’s relationship or the new (and back to old) dynamics within the precinct and NYPD as a whole. 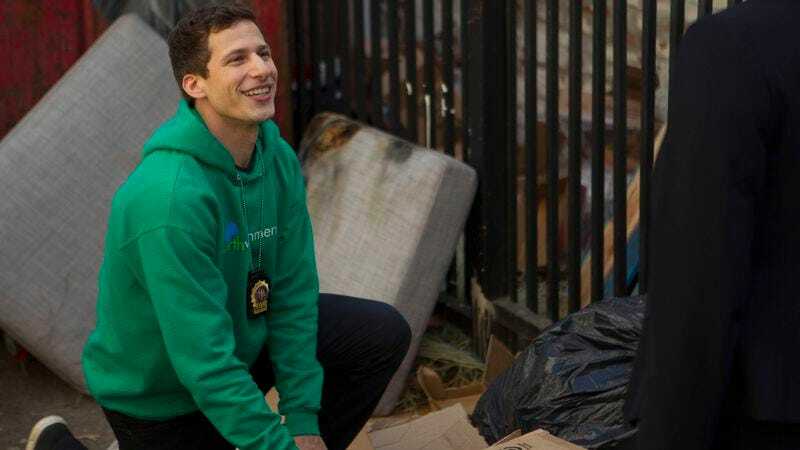 Season three has yet to completely get into the groove of “normalcy,” even with Holt and Gina back in the Nine-Nine and Jake and Amy simply being detectives who just so happen to be a couple. But the biggest problem with “The Mattress” is that it’s the biggest example of that “perfectly fine” status. In fact, it feels like an episode composed of three different C-plots, which is about as “perfectly fine” as you can get. “The Mattress” isn’t a laugh out loud episode so much as it is a polite smile and escaped chuckle episode, and that counts for all of its plots. It’s an episode with solid moments throughout but also one that is off-kilter from the moment that the cold open focuses on Hitchcock and Scully (who at least know where the Quaaludes are). What makes how “perfectly fine” the episode is stick out even more is moments like the quick “Get Low” mattress montage, which honestly feels like a product of a much better and much more manic episode. That montage is also a reminder of how great Brooklyn Nine-Nine is when it comes to music cues, especially for a show that doesn’t use them all that much. That montage is a reminder of how much better the rest of the episode can be. Like the “Get Low” montage, there are plenty of little gems sprinkled within the episode. After all, when I say “perfectly fine,” please don’t interpret that as “dud.” There’s Boyle singing the Charles In Charge theme song to himself as he parks; there’s Rosa saying “poopy head”; there’s Holt and Gina’s need to over-explaining their lessons to the supposed dunderheads who they have to teach; there’s Holt’s overwhelmingly blunt reactions to Amy and Amy’s understated facial expressions in response to them. But at the same time, speaking of Holt, this feels like an episode that relies greatly on his character’s verbal ticks—like when saying things like “raspberry sherbet”—and not on that much actual humor. And while Andre Braugher’s line delivery is arguably the single best part of Brooklyn Nine-Nine, here, it feels like a masking mechanism for a much weaker episode than usual. A major reason why this week’s episode feels like one with three different C-plots is because it even goes with the default plots (on a show that’s great when it changes up the ensemble) of not just Jake/Amy but also Gina/Boyle and Rosa/Terry. That sadly means that this week’s Rosa/Terry plot suffers from what a lot of Rosa/Terry plots tend to suffer from: There appears to be no other idea as to what to do with the two character, so the show puts them together and gives them a story to prove just how much these polar opposites have in common. It might sound odd coming from me, but last week’s Rosa/Marcus/Holt plot hit the emotional beats so much better than this week’s Rosa/Little Brother Sam/Terry plot, to the point where this just feels like a weak redux of what we saw last week. Don’t get me wrong—Rosa’s Little Brother Sam has about the same amount of personality and actual character traits as Marcus, but Marcus was also an “established” character and major part of Rosa’s life. Little Brother Sam exists solely for a lesson, just like the mattress and Gerty. This episode is Brooklyn Nine-Nine’s version of a Very Special Episode, only it doesn’t go full tilt and ends up at that “perfectly fine“ level I mentioned. What’s interesting about the typical Rosa/Terry plots is that they’re often “don’t these people have jobs?” plots, despite it not quite making sense with these two characters in the first place. Terry is in a leadership role, and we know from last season that Rosa wants the same thing in her career; that’s why of the best episodes for Rosa/Terry plots is “The Mole,” which managed to nail the business side of things with the personal between the two of them. Little Brother Sam getting in trouble makes this week’s plot veer somewhat into business, but it’s very much a plot point for the sake of the message (as is Jake and Amy’s case with the Taxi drug and Boyle and Holt’s parking shenanigans). Ah, at least we’ll always have Gigglepig. As for the “A-plot” of the episode, “The Mattress” changes up the dynamic to make it all about Jake and Amy as a couple who just so happen to be detectives; and while it’s an important discussion for the sake and future of their relationship, it’s not exactly the most fun use of the characters’ time. What’s worked so far about Jake and Amy is their uncanny ability to be on the same page as a couple, despite how different they are on both mental and emotional levels. But as television has stated time and time again: There’s no fun or entertainment in a happy couple. Yes, this has been shown to be absolutely false on more than one occasion, but it’s still a basic rule of television. With Brooklyn Nine-Nine going through the uncharted territory of Jake and Amy though, it does make quite a bit of sense for Jake and Amy to have their first argument sooner rather than later. It just so happens to occur in the middle of a weak case-of-the-week, with a metaphor that’s not particularly poignant (unless you’re Jake), and a plot that zigs almost entirely where you think it will zig, which isn’t exactly Brooklyn Nine-Nine’s style. The plot also expects the audience to buy that Jake and Amy aren’t really all-in in their relationship, which isn’t really possible given who they are. Jake laid all of his cards out on the table for Amy, after so much pining. And Amy wouldn’t have possibly risked their friendship and professional career for a fling (even when they tried to keep it “casual”), especially with how much of a mess Jake is in the first place. After all, the man thinks goose have hair, not feathers. And he doesn’t even know who the Puzzle Master is. This week in webisodes Brooklyn Nine-Nine needs: Brian (Apartment 23’s Michael Blaiklock) sounded like he had a lot to say about mattresses. He deserves that online outlet. Or Jake can have a CM Punk-like Grammar Slam. I don’t see how that can fail. *I was going to say “mattress-ful” but no one needed that. Thank you to Jesse Hassenger for filling in for me last week. I can’t believe I missed the “farewell to Nick Cannon” episode. As for the reason this particular review is posted Monday morning, some of you already know that I’ve been in a war of attrition with my internet service provider. Sadly, Brooklyn Nine-Nine was a casualty of this war. Rosa: “This isn’t Cagney calling Lacey a ‘poopy head’. I’m not just gonna give him a time out.” It’s a good line—especially with Terry’s gasp—but it’s an even better line when it’s completely out of context. Also, as someone who is not a fan of kids, I definitely would have thrown the book at Little Brother Sam. He shoplifted a phone! Sorry about my cold heart. I’ve stated before that Boyle as Jake/Amy’s number one cheerleader isn’t exactly my favorite thing—when it’s all they give him, which luckily isn’t what this episode does—but I can’t deny how great Joe Lo Truglio’s line delivery is during those exchanges. What if they had just let him buy the damn mattress?